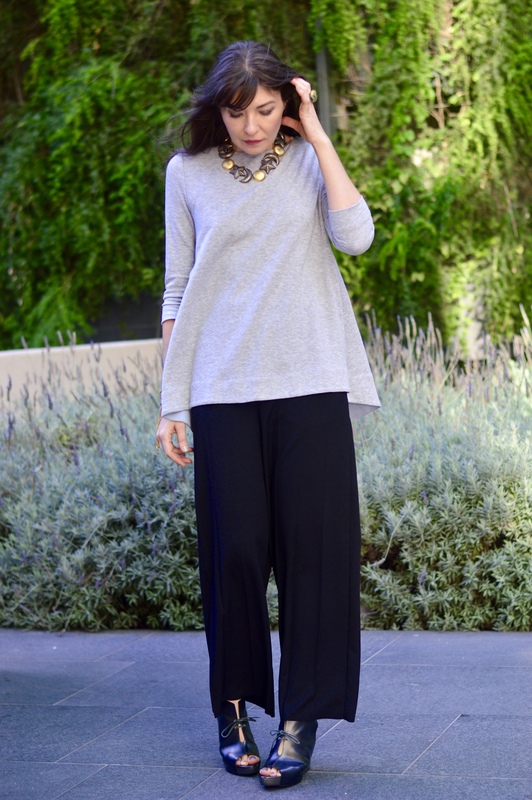 I love finding easy to wear separates that I can reach for everyday, but that offer a little more then a basic closet staple. 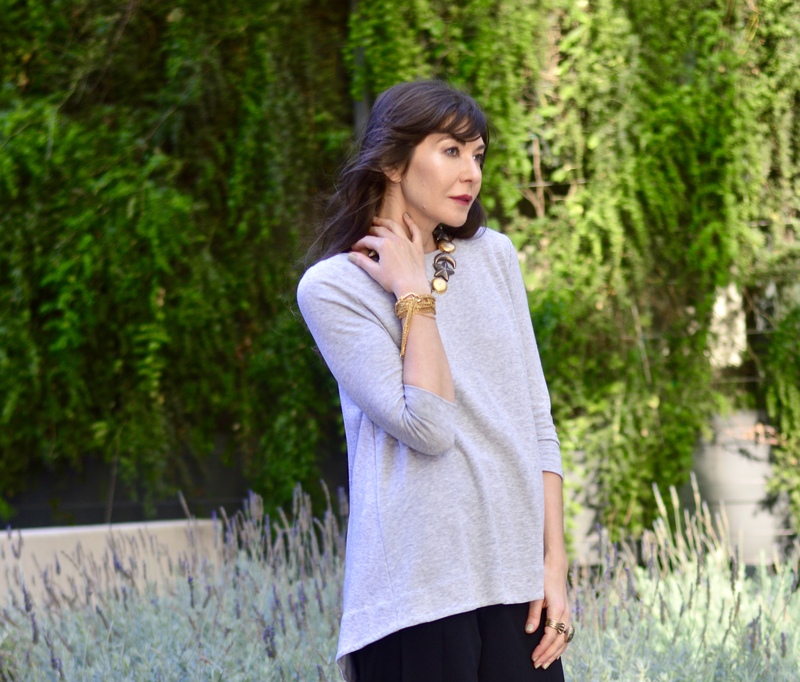 This generously cut A-line top with a Watteau-like back is from Cos my go-to for elevated basics. The H&M sister store, offers minimalist designs with a twist. I think (hope) it will inevitably open in San Francisco! At this point I get to shop there when I visit Los Angeles or online. The wide leg pants are Cos a well. And can be easily dressed up with a a slinky top, and will look amazing with a chunky sweater when the temps rise. I think the more volume a piece of clothing has the more luxurious it looks, and frankly more expensive. And it is more expensive to make, since there’s more fabric used. Thankfully, Cos price points are very approachable, and would recommend signing up for their mailing list to keep on top of sales. To accessorize all that wonderful expanse of fabric, I chose a star, moon, and sun necklace from the ’80s (I wore the matching bracelet here). The mixed metals really make it pop. There’s something about celestial motifs that’s whimsical and high fashion (a fave used by Christian Lacroix and Yves Saint Laurent).The necklace, I wore in a previous post, I wrapped around my wrist. Nothing is better then jewelry that can do double or triple duty! What are you go-to wardrobe basics? Please share in the comments. Top: Cos, similar here and here / Pants: Cos, similar here / Shoes: Martha Davis, here and here / Necklace: vintage, contact info@sashamaksvintage.com / Necklace worn as bracelet, contact info@sashamaksvintage.com / Rings: personal collection, similar here, here and here. Like Sasha Maks Vintage on Facebook and follow on Instagram and Pinterest. Sign up for news on latest arrivals and upcoming events here. Define you personal style and become your most fashionable self. Contact Styled by Sasha Maks at info@styledbysashamaks for a complimentary style consultation. Like Styled by Sasha Maks on Facebook. Well designed clothes make life and more to the point dressing easier. As I wrote in my last post, I first came upon Negarin London in LA, in one of the best shopping areas in Venice on Abbot Kinney. Since I’m a big vintage shopper, I was immediately drawn to the silhouettes reminiscent of the 50s, 60s and 70s, and a sophisticated color palette in the boutique’s window. While chatting with sales person in the store, I was happy to hear that Negarin London would be soon coming to San Francisco. Forward to several or more months later, and Negarin London has found a home in Cow Hollow on Union Street. Trained as a sculptor and painter, Negarin Sadr, the founder and creative director, approaches the design process by exploring color and shape as opposed to being inspired by a particular era or muse. In preparation for my trunk show next Wednesday at the boutique, I wanted to create a couple of looks, to feature my fave pieces. 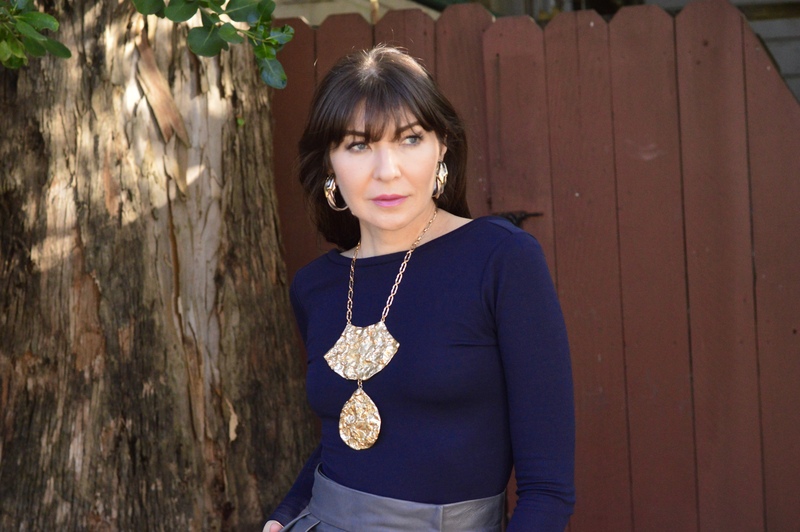 I went with a neutral palette of navy, brown, and grey against which I could showcase a runway size necklace by Napier in a distinctive textured metal. The wrap leather midi skirt is the standout piece here. I styled it with a midnight blue bodysuit that creates a sleek line and the perfect canvas for a knockout necklace. The elegant short brown coat and casual luxe slippers complete a bold but relaxed look. 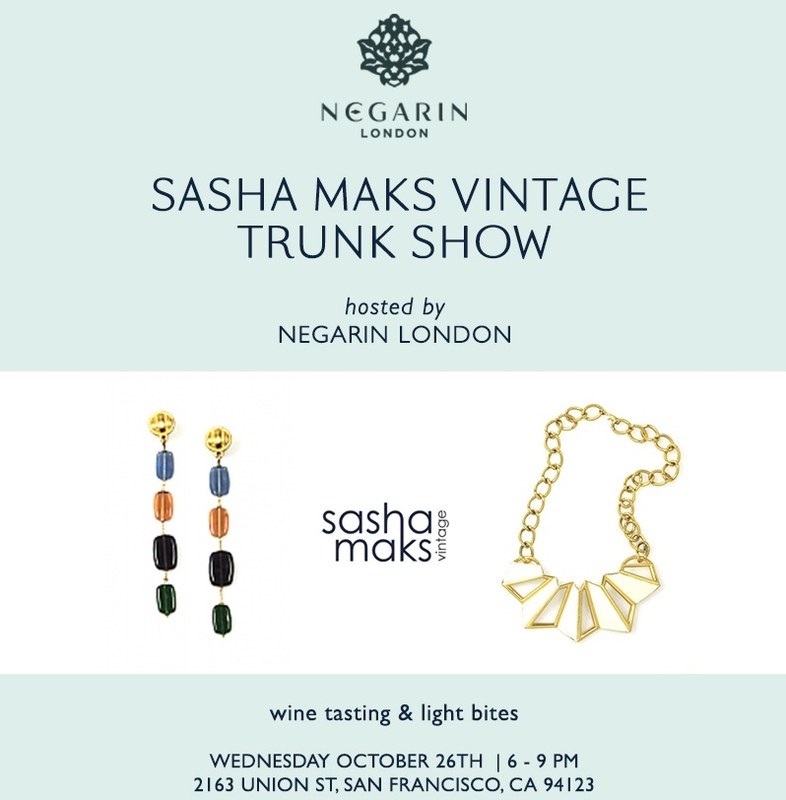 We’d love to see you next week at Negarin London’s new boutique and discover the collection for yourself! Blazer: available at Negarin London, SF, similar here / Bodysuit, here / Skirt: available at Negarin London, similar here and here / Bag: available at Negarin London, similar here / Sunglasses: here / Shoes: Michele Baconnier, here / Necklace: Napier, contact info@sashamaksvintage.com / Hoops: contact info@sashamaksvintage.com / Rings: personal collection, similar here, here and here. 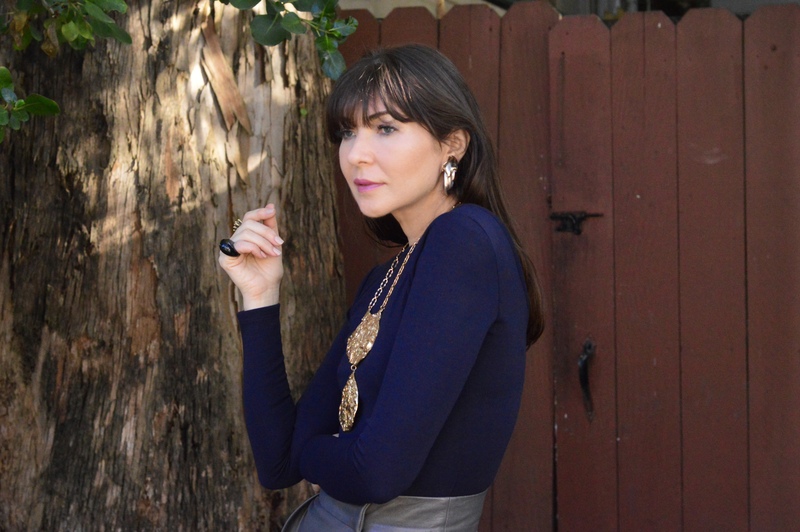 for an evening of vintage jewels, whimsical women’s fashion and wine tasting. Sip Ripe Life Wines and enjoy goody bags by Ziesche Modern Apothecary. Enter to win a styling session from Styled by Sasha Maks. Last week I wrote about an easy uniform of blazer and tee paired with jeans. Here’s another look I often rely on to make dressing effortless and chic—a statement blazer thrown over a sleek slip dress. I’m seriously obsessed with slip dresses! I have some vintage slips I can’t wait to wear and feature on the blog. The trend is going strong and I’d love to find one in the fabric of the season—velvet. And as I have mentioned in previous posts, blazers are the hero pieces in your wardrobe and this collarless iteration in a striking teal is from Negarin London (currently popping up on Union Street in SF), and next time you’re in Venice Beach swing by their boutique on Abbot Kinney. I’m mismatching earring here. These where meant to be worn together! Only slightly different in design, this is an easy way to experiment with the trend. Keep the color, metal, and size similar while playing with variations of the form. The necklace is a new find, and I may end up keeping it. It can be styled numerous ways, even as a bracelet. All the pieces are coming to the website soon. The last word is on the shoes. I have been hunting for the glove shoes (find out more about the style here), that where first brought out by Martiniano (which run too narrow for me) and closely followed by Celine, They are very simple flats that fit high on the vamp, just a little different from the ballerinas to make them more interesting. Obvi the minimalist style pretty much goes with everything, and of course leave it to Zara to design a pair that fits me perfectly. What are you hero wardrobe pieces? Please share in the comments. 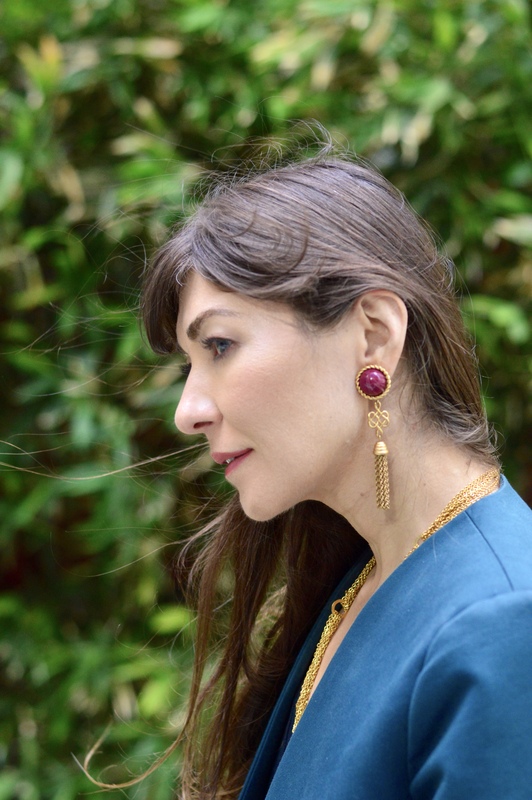 Blazer: Negarin London, similar here and here / Trouve, similar here / Shoes: Zara, here / Monet tassel earring (sold as a pair), contact info@sashamaksvintage.com / Cabochon drop earring (sold as a pair), contact info@sashamaksvintage.com / Necklace: Sasha Maks Vintage, contact info@sashamaksvintage.com, similar here / Rings: personal collection, similar here, and here. One thing I always have luck finding are blazers, and coats. I prefer the vintage ones for the quality and design for a much better price compared to what is available new. I’ve been looking to replace my vintage Kenzo black blazer and recently found this vintage Issey Miyake double breasted blazer, I love how elegant it is in its simplicity. It’s slightly too big for me, which will be great when I want to layer it over another jacket. And it’s length makes it work almost like a short coat. And it’s super lightweight and warm. A blazer is a hero piece in your wardrobe, it makes everything else fall into line, giving even the most casual pieces a sober tone. Here, I’ve paired it with one of my most prized tees, a Charlotte Gainsbourg concert tee. She’s also a major style muse for me! 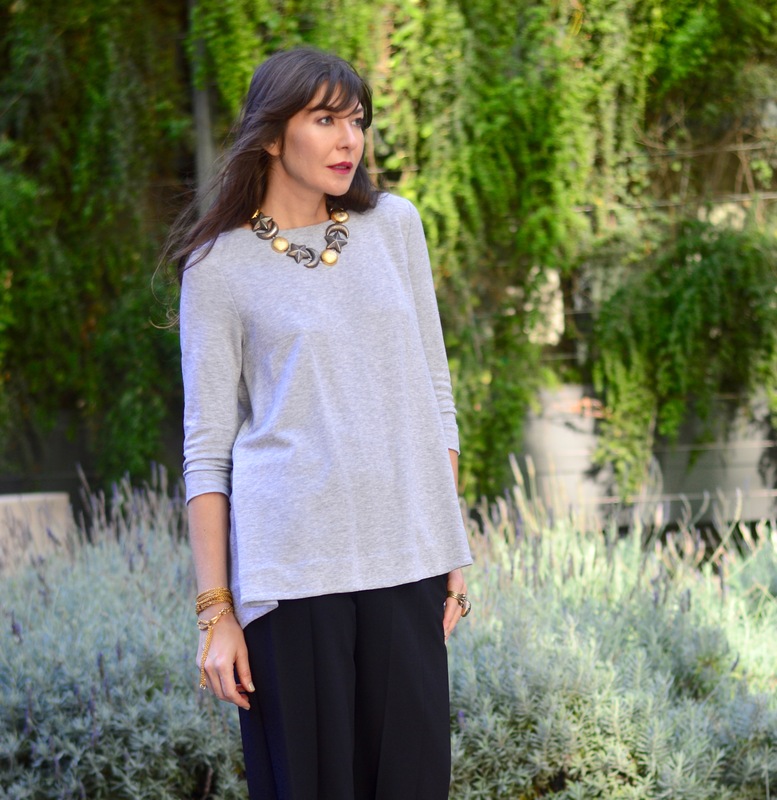 If you don’t follow this lady for style inspo, you’re missing out! Ripped skinny jeans and derbies round out the casual but cool look. I layered two statement bracelets, one I cannot part with, the other is a celestial design, an unsigned piece by Simone Edouard, is coming to the e-boutique soon. I’m doing the singular earring thing here. This sculptural brass colored design is from the 80s and will be added soon as well. Blazer: vintage IsseyMiayke, similar here / Tee: Charlotte Gainsbourg concert tee, similar here / Jeans: Rebecca Minkoff, similar here / Bag: Scabby Robot, here / Shoes: Michael, Michael Kors, similar here and here / Earrings, 80′s, contact info@sashamaksvintage.com / Celestial bracelet: Sasha Maks Vintage, contact info@sashamaksvintage.com / Cabochon bracelet: personal collectino / Rings: personal collection, similar here, here and here.